Hailing from Bordeaux, France, STRYNN is a new star in the sky and have just released their debut Decadence. STRYNN play Black Metal the Scandinavian way and thus focus more on atmosphere, melancholy and melody than on hateful blastbeats and destruction, what gives Decadence a very own note. Songs mostly range in mid-tempo fields and are straightly composed. No keyboards, no frills. STRYNN only use a few guitar riffs, which gives the record a slightly monotonous but psychedelic atmosphere. Guitars have a nearly clean sound and even the vocals, sung by Missis Dwimorberg and Mister Anadrak, can be understood, but I actually can’t hear a proper difference between both of them. 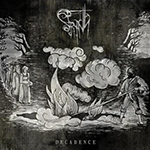 Decadence is a surprisingly good first full-length, but I am sure STRYNN can do better. More stringently composed melodies and a more compact songwriting and the next album will be a burner.